The foremost principle of the Knights of Columbus, charity, is never more on display within the Dallas Diocese than when members of multiple councils come together to volunteer at functions of the Special Olympics. From Oct. 30 to Nov. 9, involvement from 42 Brother Knights plus six of their family members helped make the activities of about 2,900 Special Olympians at USA Bowl on Composite Drive in Dallas all the more enjoyable and meaningful. During the competition, Knights and their relatives provided a total of 270 volunteer hours under the direction of Jim Massey, coordinator for the KC efforts at the Special Olympics for the diocese. Jim worked with Cyndi Murchison, the Special Olympics area program director, and Dwayne Lovell, the area awards coordinator. 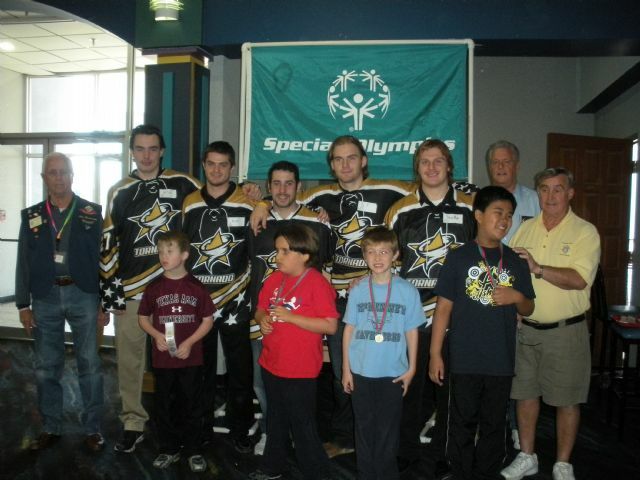 One of the other area organizations that also helped out at the Special Olympics bowling competition was the Texas Tornado, a Junior A hockey team based in Frisco. The Dallas Knights and Special Olympics have forged quite a bond over the years. KC’s are ever-present during the year, at events for swimming, basketball and track and field – the latter including the massive Summer Games that are held annually around Memorial Day weekend at the University of Texas at Arlington.